This entry was posted in Birds, Nature, Wildlife and tagged British Trust for Ornithology, RSPB, sparrows, Wildfowl and Wetlands Trust. Bookmark the permalink. I grew up in the South of England during the 50/60s and remember hearing cuckoos and skylarks all the time among many others. Visiting this past August/September I noticed how quiet the countryside has become with hardly any songbirds at all. I found it quite depressing. My mother likes to blame the French for the current lack of Thrushes as she says they have eaten them all but we did see one in a park in Hove so they are not completely gone. I did not see one skylark over the south downs at all and it seems that only the Herring Gull is doing well along the coast. What a sad state of affairs this is. I can in the future people will have to reintroduce the sparrow to England from America where it has done extremely well since a few were released in a Brooklyn Cemetery in the late 1800s. Habitat loss is the number one problem for American birds, too; add to that climate change, window strikes, feral cats and other predators. Oddly enough House Sparrows are often blamed for running off our native species, but I don’t see how that computes at all, when they generally live in urban areas and are virtually non-existent in the countryside. 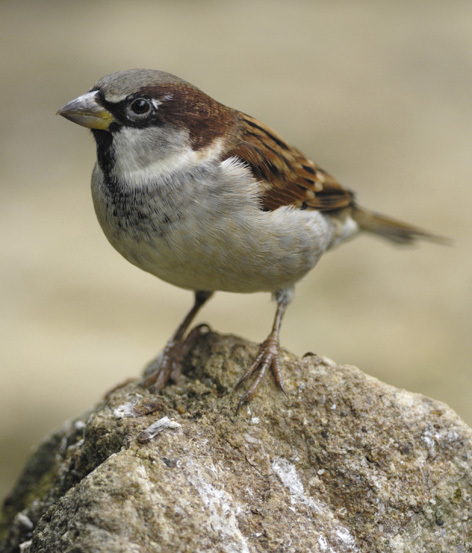 As an extreme example, House Sparrows are second only to Rock Pigeons in the Chicago Loop; indeed they might outnumber the pigeons. I wonder if the American version of this species has evolved to become omnivorous and developed other survival instincts tailored the U.S. urban environment, which can’t possibly be any better for birds than the U.K. Or perhaps the Chaffinches are evicting the House Sparrows.